"I'm passionate about providing therapy that is family friendly, effective and based on up-to-date research. Emma has worked in various paediatric occupational therapy roles since graduating from James Cook University in 2005. She has experience working within school, community health and hospital settings. She has completed a post-graduate Master of Health Sciences (Occupational Therapy) from the University of Sydney (2010) as well as extensive training relating to the area of infant and child development, including play/social skills, motor coordination, cognition and sensory processing. Emma has attended the Picky Eaters vs Problem Feeders: The Sequential Oral Sensory (SOS) Approach to Feeding training, including advanced workshops relating to children on the Autism Spectrum. 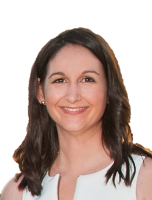 Through working alongside various speech pathologists, dietitians, physiotherapists and medical practitioners, Emma has gained a broad range of knowledge and experience to help make sense of developmental and mealtime challenges. She readily collaborates with families' healthcare and childcare/school team, including providing updates to referring GPs/Paediatricians and supporting families to access other complementary services in the community. Emma is currently completing a professional certificate in DIR Floortime, a developmental framework for interdisciplinary assessment and intervention for autism spectrum and related disorders . Emma is a member of the National Paediatric OT Interest Group focusing on Children Identified as 2E (Twice Exceptional: Gifted Children living with a Disability). Emma's professional achievements include receiving the Occupational Therapy Achievement Award at JCU (2005) for highest academic results in her university cohort, Qld Occupational Therapy Fieldwork Collaborative Practice Education Commendation for excellence in supervision of undergraduate students (2010) and co-presenting at the National Birth to Three Matters Conference in 2008 on interdisciplinary services for children. Emma enjoys living in Mackay, Queensland, with her husband and two children. In her spare time, Emma loves travelling, reading and playing at a local park with her kids.